Kate DeYoung was born on 13 August 1853 in Buffalo, Erie County, New York. Joseph J. DeYoung and Hannah Heath appeared in the New York state census of 1 June 1855 in Buffalo, New York. Other members of the household included Kate DeYoung. Also in the household was Mary Bristol (age 19), identified as a married cousin, and two boarders. Joseph J. DeYoung and Hannah Heath appeared in the US federal census of 1 June 1860 in Buffalo, New York. Other members of the household included Kate DeYoung. Joseph J. DeYoung and Hannah Heath, appeared in the US federal census of 1 June 1870 in Buffalo, New York. Other members of the household included Kate DeYoung, Edward DeYoung and Edward Sniggs. 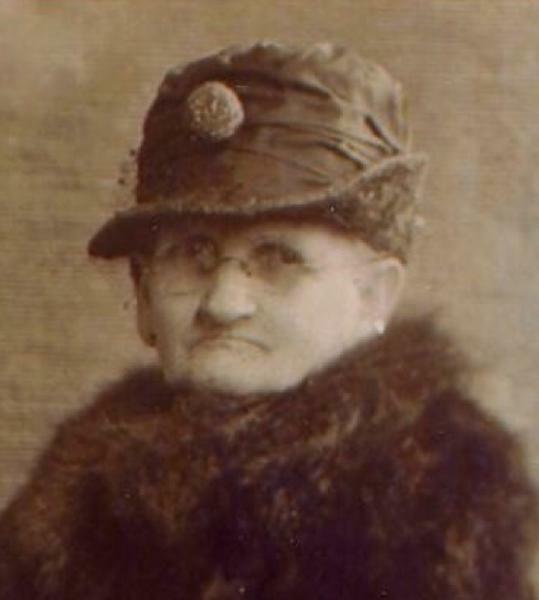 Also in the household was Sallie Ballow (age 40). Hannah Heath appeared in the New York state census of 1 June 1875 in Buffalo, New York. Other members of the household included Kate DeYoung, Edward Sniggs and Daisy Ethel DeYoung. Hannah apparently was owner of the residence. Also boarding in the household was engineer Charles J. Clark (age 32). She married William Simpson Wilson, son of Peter M. Wilson and Margaret Simpson, on 2 November 1875 in Buffalo, New York. William Simpson Wilson and Kate DeYoung appeared in the US federal census of 1 June 1880 in Buffalo, Erie County, New York, at 1580 Main Street and an infant daughter, born February 1880, is recorded but struck through, apparently having died (?). Other members of the household included Ida Jeanette Wilson and Margaret Blanche Wilson. William Simpson Wilson and Kate DeYoung appeared in the New York state census of 16 February 1892 in Buffalo, New York. Other members of the household included Ida Jeanette Wilson, Margaret Blanche Wilson, Grace M. Wilson, William Edward Wilson, Hannah Heath Wilson, Kate R. Wilson and Charles A. Wilson. William Simpson Wilson and Kate DeYoung appeared in the US federal census of 1 June 1900 in Buffalo, Erie County, New York, at 30 Maywood. Other members of the household included Ida Jeanette Wilson, Grace M. Wilson, William Edward Wilson, Hannah Heath Wilson, Kate R. Wilson, Charles A. Wilson, Herbert Longsdale Wilson and Harriet C. Wilson. Daughter Grace also is enumerated in the household of her sister Margaret Devine. William Simpson Wilson and Kate DeYoung appeared in the US federal census of 15 April 1910 in Buffalo, Erie County, New York, at 153 Howell Street enumerated next to daughter Ida Chapin.. Other members of the household included William Edward Wilson, Charles A. Wilson, Herbert Longsdale Wilson and Harriet C. Wilson. Kate DeYoung became a widow at the 19 April 1911 death of her husband William Simpson Wilson. The following appeared on 20 April 1911 in The Buffalo News: [Died] In this city, April 19, 1911, William S. Wilson, husband of Kate DeYoung Wilson, aged 57 years. The funeral will take place from the family residence, 153 Howell street, Saturday afternoon at 2:30 o’clock. Friends are invited to attend. William Edward Wilson appeared in the New York state census of 1 June 1915 in Buffalo, New York, at 153 Howell Street. Other members of the household included Kate DeYoung, Charles A. Wilson, Herbert Longsdale Wilson and Harriet C. Wilson. Kate DeYoung appeared in the US federal census of 1 January 1920 in Buffalo, Erie County, New York, at 709 Riley Street living at the same address as Kate's daughter Kate Mertz and family.. Other members of the household included Herbert Longsdale Wilson. Charles John DeVine and Margaret Blanche Wilson appeared in the US federal census of 1 April 1930 in Buffalo, Erie County, New York, at 13 Hartman Place. Other members of the household included Kate DeYoung, Francis W. DeVine, Lester Charles DeVine, Ruth E. DeVine, Edward J. DeVine and Herbert Longsdale Wilson. Herbert's wife Ida is enumerated in Cleveland, and daughter Virginia is enumerated in Buffalo with her maternal grandmother Venus Sickler. A photographic portrait was made of George and Ida Wilson Chapin about 1935. Kate DeYoung died on 30 January 1941 at age 87.